Los Angeles, April 8, 1984- Former Pittsburgh Pirates’ pitcher Dock Ellis says he was under the influence of LSD when he pitched a June 12, 1970 no-hitter against the San Diego Padres. Ellis, later co-ordinator of an anti-drug program in Los Angeles, said he didn’t know until six hours before his June 12, 1970 no hitter that he was going to pitch. “That’s when it was $9.50 to fly to San Diego. She got me to the airport at 3:30. I got there at 4:30, and the game started at 6:05pm. It was a twi-night doubleheader. I can only remember bits and pieces of the game. I was psyched. I had a feeling of euphoria. I was zeroed in on the (catcher’s) glove, but I didn’t hit the glove too much. I remember hitting a couple of batters and the bases were loaded two or three times. The Pirates won the game, 2-0, although Ellis walked eight batters. It was the highpoint in the baseball career of one of the finer pitchers of his time, and arguably,one of the greatest achievements in the history of sports. The details of how that game came to be are almost as much fun as the fact that it happened. According to Ellis (and, it should be noted, all of this is according to Ellis), he went to visit a friend in Los Angeles the day before his start, took some acid and stayed up late into the night drinking and doing drugs, subsequently losing track of which day it was. The day of his start, he woke up and, thinking he was supposed to pitch the next day, took another hit of acid at noon, only to learn two hours later from his friend that he was, in fact, supposed to be on the mound against the Padres that evening in San Diego. Ellis got on a plane an hour later and made it to the park 90 minutes before first pitch. Nonetheless, it’s an incredible story attached to an incredible career and life—one unfortunately overshadowed somewhat by the no-hitter. As a player, Ellis was equal parts ferocious and flamboyant. Once, in 1974 against the Reds, he made it his mission to plunk every Cincinnati batter in an attempt to intimidate the nascent Big Red Machine; he got five hitters into it, nailing the first three and throwing over the heads of Tony Perez and Johnny Bench, before he was pulled. Another time, as a member of the Athletics in ’77, he he took pitching charts he’d been ordered to fill out and burned them in the locker room, setting off the sprinklers. And he had to be expressly told by Commissioner Bowie Kuhn in ’73 not to wear hair curlers onto the field. Ellis was more than just a character, though: He was a key part of the 1971 World Series champion Pirates and the ’76 Yankees, who won the pennant, and started the ’71 All-Star Game for the National League opposite Oakland’s Vida Blue—the first time two pitchers of color had ever started the Midsummer Classic. Off the field, Ellis was ahead of his time. He was outspoken on the rights of black players in baseball and frequently attacked the sport for its institutionalized racism, and was an early champion for free agency. He was also open about his substance abuse and the proliferation of amphetamines—known as “greenies”—in the game, which he used before virtually every one of his starts, including the acid no-hitter. After baseball, he got sober and started a career as a counselor for drug addicts, focusing on helping prisoners kick their addictions. Just 11 days before he faced the NL West’s sixth place San Diego Padres on Thursday, June 12, Dock Ellis had beaten the very same Padres, 5-1, with a strong six-hitter. Now, he faced them in the first game of a doubleheader before a crowd of 9,903 at San Diego Stadium. The 25-year-old Ellis lugged a 4-4 record for the second place Pirates of the NL East. The Padres, in their second year in the National League, countered with Dave Roberts. Roberts was outstanding. He made only two mistakes, serving up second and seventh inning home run balls to Willie Stargell. But Ellis was better. Although he was wild, walking eight and hitting one, the Bucs‘ hurler set the Padres down without a hit. Ellis struck out six and retired the side in order only three times. It took a fantastic catch by second baseman Bill Mazeroski to preserve the no-hitter. Leading off the seventh, pinch-hitter Ramon Webster laced a low, hard liner to Mazeroski’s right. The slick fielding second sacker took two steps, dove and made a sparkling backhanded catch. The Padres hit few other balls hard. Ellis, however, was in trouble right from the star. In the first after getting Dave Campbell to fly out to right, he walked Steve Huntz. Al Ferrara fouled out to first, but Nate Colbert followed with another walk. The inning ended when Ollie Brown was called out on strikes. Ellis retired the Padres in order in the second with the help of a fine one-handed catch in center field by Matty Alou on Chris Cannizzaro’s hard liner. But with two outs in the third, Huntz walked again. Ferrara then struck out. It was a similar story in the fourth when Ellis hit Ivan Murrell with a pitch after strikout out Colbert and Brown. After Murrell stole second, Cannizzaro fouled out behind the plate. Ellis got wild again in the fifth after getting the firs two outs. He walked Campbell, who stole second, and Huntz for the third time. Ferrara grounded out to end the inning. The pattern differed in the sixth when Colbert drew a leadoff walk and stole second. Ellis got Brown and Murrell on pop ups, then walked Cannizzaro before striking out Tommy Dean. Mazeroski made his brilliant play on Webster in the seventh, and Ellis went on to reitre the side in order. In the eighth, Ferrara flew out to right and Colbert hit a sinking liner that Alou grabbed at the knees in center. Brown walked, but was stranded as Murrell forced him at second a grounder to short. Ellis ended strongly, getting the Padres out in order in the ninth. Cannizzaro opened with an easy fly to Alou in center. Pinch-hitter Van Kelly then bounced a grounder to first where Al Olivergloved it and threw to Ellis covering the bag for the second out. Ed Spiezio pinch-hit, and after running the count to 2-2, took a called third strike for the final out. The Padres came back to win the second game, 5-2. Ellis went on to fashion a 13-10 record for the season. 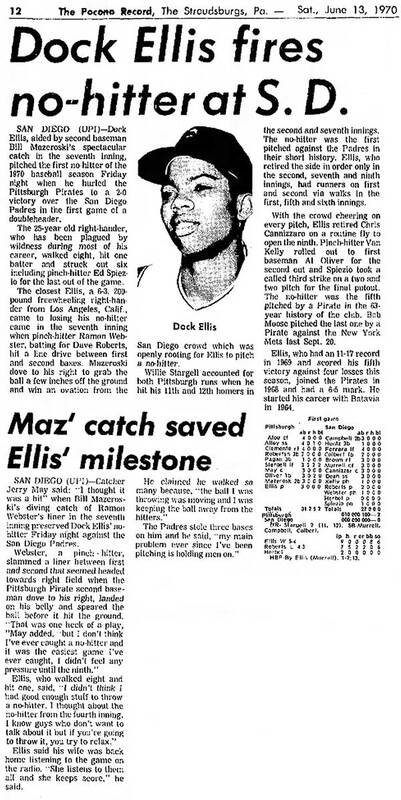 Be the first to comment on "Dock Ellis 6/12/70 San Diego LSD no-hitter"